Differentiate between and a true Insane person and a person who is pretending to be an insane because of fear of the lawful punishment or some other motive by keeping following things in your mind. Predisposing or exciting cause may present in true insane but not in false one. There are usually a peculiar characteristic facial expressions in well develop cases of insanity While facial expression in false insane person are normal or easily distinguishable. The true insane individual shows signs and symptoms of insanity irrespective of his conduct being observed or not while a false insane will show signs of insanity only when he is observed and there is total absence of symptoms when he thinks that he is alone or not being watched. 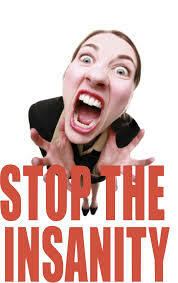 Sign and symptoms usually point to a particular type of insanity in true insane. ( e.g schizophrenia, mania, Bipolar disorder etc) while a non insane person will do what ever come in to his mind and his signs and symptoms don't indicate a particular type of insanity. A true insane person can stand violent exertion for several hours or days without exhaustion, perspiration or sleep while in a non insane, violent exertion leads him to relaxation, exhaustion and sleep. Habits of a true insane person are invariably dirty or filthy .An insane may smear his body with stool or urine while habits are not usually dirty or filthy in non insane Though a false show may be put to that effect. Physical manifestation of true insanity, Viz dry harsh skin, furred tongue, constipation, anorexia (loss of appetite) and insomnia (loss of sleep ) are present in a true insane while not in a feigned insanity. True insane is not worried about being repeatedly examined while a false insane person shows dislike for repeated examinations.